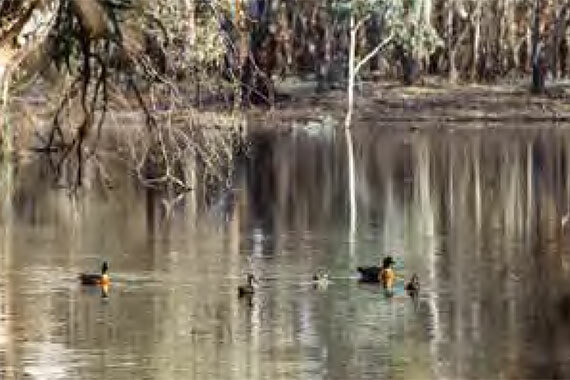 Thirteen wetlands, creeks and billabongs in the lower Murray region were given a significant boost with environmental water in 2014–15. The delivery of environmental water focused on maintaining and improving vegetation condition, quality and extent throughout the wetlands, floodplains and waterways in the lower Murray region, and in some cases, rehabilitating salt-affected wetlands. Environmental watering of the Nyah-Vinifera park was particularly successful. This important floodplain forest received 1,766 ML of environmental water, which provided much-needed flows through the park and, for the first time, through the Vinifera creek system. Swamp wallabies were seen in the forest for the first time in many years, indicating a response to improved condition. The watering also attracted a strong response from resident populations of frogs, birds and small fish, who appreciated the revived native plant habitat. At several sites, environmental watering supported populations of the critically endangered Murray hardyhead by maintaining water quality. In March 2015, 2,500 Murray hardyhead were relocated to Brickworks Billabong. Watering of the billabong has maintained the condition of sea tassel, which is important habitat for Murray hardyhead.